With Novak Djokovic struggling to rediscover his form, Game Insight Group analyses the data and considers the best way forward for the former No.1. When Novak Djokovic lost his second match in a row in Barcelona last week, many wondered what, if anything, can get the Serb back to his peak form. 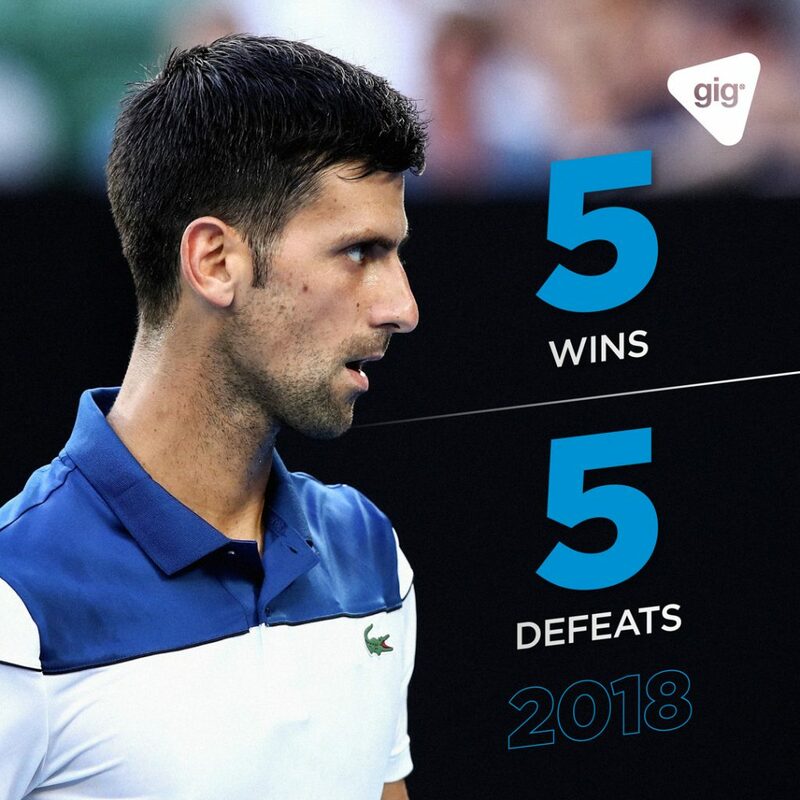 After a rocky 2017 season that was ultimately derailed by injury, there has been little in Djokovic’s 2018 start to suggest a turnaround. In fact, the evidence suggests the 12-time Grand Slam champion rates among the bottom 10% of leading players to have made a similar comeback over the last 30 years. So is it time to go back to the drawing board? Or is it a case of getting back on court, win or lose, and grinding away? Djokovic has only appeared in five events over the first quarter of the year and has lost in the first round of three of those. His overall win-to-loss record is exactly 50%. One would have to go back to 2006 to find similar numbers for the Serb, a shock for a player who seemed untouchable only two years ago. But, for a player who has been battling injury, how surprising should a slump of this extent be? Since 1990, there have been 82 instances* where a player of Djokovic’s level** has been more than eight weeks into the regular season, with only six weeks played in the previous six months – highly suggestive of a comeback due to injury. How have the win rates of those players’ returns compared to Djokovic’s 50%? * Click here for the full list of 82 players. Of those 82 players to have had a similar comeback trajectory to Djokovic, only eight had a win rate equal to or lower than the Serb’s. They include bumpy returns by Pat Rafter in 2000, Lleyton Hewitt in 2009 and Marin Cilic in 2015. Although Djokovic’s difficult comeback isn’t unprecedented for a player of his calibre, it does put him among the lowest 10% of those returning players in the past three decades. What, if anything, could provide a ray of hope for Djokovic’s chances of turning things around? If we look at where the same 82 players were six months after the first six playing weeks of their return (Djokovic’s situation now), we find that 58% improved on their six-week win rate. However, the players that played more weeks in those six months far excelled that rate. Of players who played 15 to 19 weeks in those six months, 76% improved on their six-week win record. For players who played 20 weeks or more, that percentage was 86%. Playing more weeks might not be the cause of better performance; it could just be that those who played more in the next six months were those who were doing better and buoyed by their good form. The association nevertheless suggests that Djokovic’s choice to take the Barcelona wildcard might have been the right one, even if he didn’t advance to the second round, and his decision to turn down an invite in Estoril this week is a missed opportunity. Losing might be an unpleasant and unfamiliar feeling, but getting back on court and playing more matches in the coming months is one way Djokovic can put the odds of a resurgence on his side. ** Defined as players with an Elo rating of 2000 or higher. Click here for an Elo explainer.